I’ve often said that the key to cooking quickly and producing a healthy meal from scratch is good knife skills. But in order to dice an onion or mince garlic, you need a sharp knife that can smoothly press through the vegetables. Seriously, a steak knife is no match for a carrot. I was fortunate to inherit my knives from my grandmother who swore the set of Japanese, precision hollow ground, fine stainless steel knives were too sharp. Already decades old, this knife’s blade will probably keep through my lifetime as well. Don’t buy this online – work with a salesperson to choose a company with proven quality and be sure to test out the feel and motion of the curve. Spicy beef empanadas. Salted caramel apple hand pies. Even mashed potatoes. Your friend will do pretty much everything with a little hardwood dowel. I bought mine on a whim while wandering along Shanghai Street in Hong Kong – a road that easily rivals NYC’s Chelsea Market – and find the simple, handle-free shape surprisingly useful in the kitchen. Besides, when is the last time you’ve gifted someone a stick? I WANT ONE!! I’ve been eyeing immersion blenders for years, and one is finally next on my list. Take the motor straight to the pot and puree soups without transferring to and from the processor. That means hot soup without scalding yourself, or dirtying all 18 gazillion parts of a larger machine, and at least 5 minutes of active time saved. Most of these models also come with a cup attachment to help you effortlessly blend single servings of smoothies or egg nog. The inspiration piece. 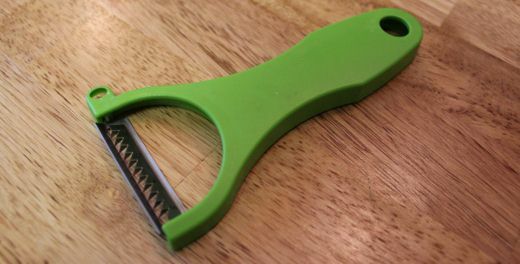 If your friend seems to have everything, but always wants to try something new – get him a julienne peeler. I bought myself a set of three peelers when I needed a kick to get cooking again and they did just the trick. With a few quick swipes you can shave carrots, cucumbers, or squash for salads or have strips to match angel hair pasta. Or, take short swipes through a potato for quick-cooking hashbrowns. So fun to use – your friend will invent new dishes for this tool. “Great cooks rarely bother to consult cookbooks.” This quote by Charles Simic in the opening pages of The Flavor Bible speaks volumes to the purpose of the book. Focusing on flavor affinities rather than specific, and limiting, techniques of individual recipes, the book helps chefs of all levels to understand tastes and create new menus. It also features dishes and advice from the world’s greatest chefs including Jose Andres, Michel Richard, and Eric Ripert. Put your friend in good company with this book and stick around to see what dishes and menus she’ll invent. This is actually an awesome post. I’m finally learning to cook, like I’ve always wanted to do, and am now being forced to do! I would totally want the immersion blender, better knives and the spice profile book! Good foodie Christmas List! Miss you! Glad you’re being forced to learn now! What have you made so far? Will you bring back any Romanian recipes for me? Miss you too! I’ve made good brisket, lasagna and cannelloni lately! And the rest is mostly basic stuff – some turns out great, some not so great. I’m getting into roasting things, i.e. vegetables. It’s a learning experience. I made some “interesting” smothered pork chops lol. OF course, I’ll bring back plenty of Romanian recipes for you to try! I have a whole peace corps romania cook book of them – yummm! And if you’re into pickling and grilling – Romania is just the place for u! Very nice! Brisket is my favorite BBQ. And I love both pickling and grilling. I’ve actually been enjoying these pickled carrots for the last couple of weeks. Can’t wait to see the peace corps cook book.